Indonesia plans to establish fishing grounds in waters north of the Natuna islands, in a bid to assert its sovereignty over an area it says is being subjected to occasional encroachment by Chinese and Vietnamese fishing vessels. Maritime Affairs Coordinating Minister Luhut Pandjaitan said on Wednesday that the government will build a designated fishing sea port and cold storage facility on one of the Natuna islands by the third quarter of this year. It will deploy a fuel tanker there to ensure Indonesian fishermen have a guaranteed energy supply to power their boat engines. "We will open up opportunities for our fishermen to go there. We get angry when other people go and fish there, while none of our fishermen are there," Mr Luhut told a media briefing. Mr Atmadji Sumarkidjo, an aide to Mr Luhut, later told The Straits Times that foreign investors are welcome to build any facility on the Natuna islands to cater to the fishing industry, but only to process fish. They cannot take part in the fishing activity. Although it lies in Indonesia's exclusive economic zone, the sea north of the Natuna islands was previously not named, and had been taken to be part of the South China Sea, which it borders. Indonesia maintains it is not a party to the South China Sea dispute, in spite of diplomatic incidents involving the waters around the Natunas. 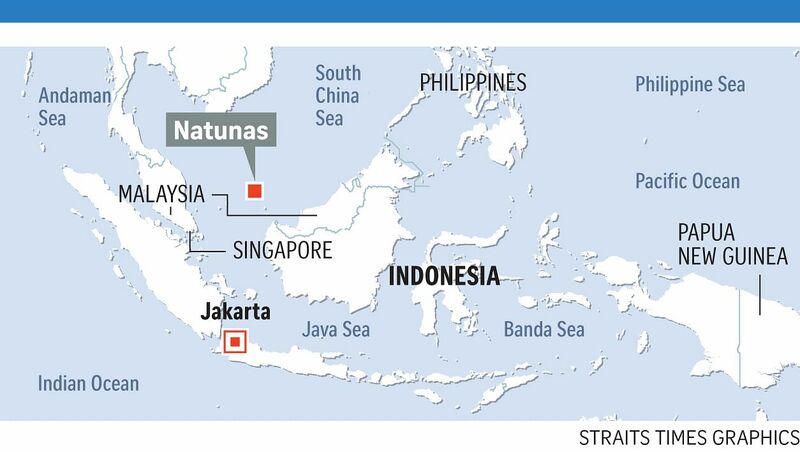 Two years ago, a senior Indonesian government official unrolled a map depicting an expansion of the nation's maritime territory, with the section of the South China Sea north of the islands named as North Natuna Sea. This, however, has never been made official. President Joko Widodo made a trip to waters off the Natuna islands on board a naval warship in June 2016. The rare trip, Mr Luhut told ST at that time, showed that while Indonesia did not expect any conflict with other countries, it remained firm in its position. "We remain friendly but Indonesia's territory and sovereignty remain Indonesia's. This is non-negotiable," he had said, noting breaches by Chinese fishing vessels in the Natunas. Mr Joko's trip followed an incident where Indonesian warships detained a China-flagged vessel and its crew for fishing illegally in waters off the Natuna islands. A year later, a Vietnamese coast guard vessel intercepted an Indonesian maritime security patrol craft that was escorting five Vietnamese fishing boats that had been caught poaching. The clash led to the Indonesian authorities losing custody of all five Vietnam-flagged fishing boats. Both sides resolved the incident through diplomatic channels and said they hoped to prevent future incidents in the South China Sea.